Pour all ingredients into blender bottle with the metal ball and Shake, Shake, Shake! Make sure you take a sip & have the sweetener to your tastes. Pour all ingredients into blender bottle with the metal ball and Shake, Shake, Shake!Make sure you take a sip & have the sweetener to your tastes. These are fantastic, however, my protein powder won’t completely dissolve, and ends up in lumps. So I have to use a blender, which defeats the purpose of taking advantage of the simplicity of the blender bottle. Any suggestions? Or what brand of protein powder do you use? We usually use the THM protein powder. I’m making up my menu for the end of the month and came across your site thanks to the Coers Family website. Your recipes look great and I have already added 2 to my menu plan. When I saw the Churro Smoothie recipe I stopped what I was doing and decided to make it right away. It is fantastic. Thank you for sharing so many recipes for me to try. I am allergic to nuts so I can’t use almond milk. Can I just use milk or do you suggest something else? 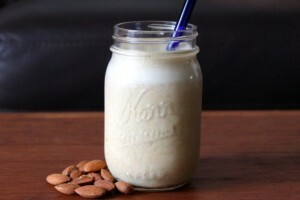 You could use a Light Coconut milk or I love Flax milk! does it change the plan to use whey isolate protein powder? I find i have less tummy issues with that as it does not contain dairy. Fern, You can use what ever protein powder, that works for you 🙂 Jay Robb has a line of egg white protein powders that are THM on plan. Can you use coconut oil in place of the MCT? You can, however the coconut milk will harden and not emulsify in a cold drink so it might make it a little chunky in my experience. I notice all these thm recipes use almond milk. what about good old goat milk? That’s a complete protein, with a little fat thrown in! Just wondering. I do not have much experience with goats milk honestly, how ever I asked some of my smarter more puristy friends and this is what I have gathered. Goats Milk is higher in fat than the Almond milk, and also has a high carb to fat ratio.They talking about fermenting it to use in Kefir Smoothies, and double fermenting to get rid of majority of fat content is recommended.Goats Milk should really be kept in an S setting. These smoothies are all written as Fuel Pull’s so using the goats milk in place of the almond milk would make this an S or possibly a Crossover. I hope that answers your question. First of all, thank you! I’ve been looking for something like this! Also, my blender bottle has the insert on the top and not the metal ball. Will this work? Yes that should work just fine 🙂 I just happen to have the one with the metal ball. Is there a replacement for the whey powder? I have all ingredients except for that. can I make these smoothies in a blender ? absolutely! Just throw it all in and blend on low.